Bitcoin and a number of other crypto-currencies have been rising in value exponentially lately. As every hot commodity, these virtual currencies have drawn quite a bit of attention from traders looking to make some big bucks quickly and preferably easily. The most straightforward way to make money on bitcoins is to just purchase some and hold on to them until the prices rises high enough to warrant a sale – in a word: sticking to the time-honored practice of buying low and selling high. The nature of Bitcoin sort of lends itself well to the idea of irreversible long-term growth, despite all the wild short-term variance, so this approach makes perfect long-term sense. Disclosure: We get commissions for purchases made through links in this post. Your capital may be at risk. This material is not investment advice. The bottom line is that according to some, the sudden value-increase of Bitcoin has simply priced most rank-and-file investors out of trading it in the above described way. This is the reason some point to when attempting to explain the sudden draw of Bitcoin-based Forex and simplified forex day trading. At a closer look though, that assertion simply doesn’t hold water. Bitcoin can be divided into very small sub-units, and those of more meager financial means can simply buy such sub-units instead of full BTCs. The value is still there, as is the variance. You’re investing in financial derivatives though. As such, those who trade such options don’t deal directly with bitcoins. Thus, they aren’t directly exposed to the massive variance of the actual price of the crypto-currency. Simplified Forex is especially well-suited to dampening this variance, since it operates with fixed potential losses and winnings, not directly linked to the size of the price-fluctuations. This is the primary draw of Bitcoin-based simplified forex which more and more brokers have been introducing lately and not affordability. Knowing that, let us direct our attention at how one can actually make profitable trades through these options. The first step is to find a broker which has Bitcoin listed as one of its tradable underlying assets. The next move is to find a profitable trading pattern to trade one (or both) of these pairs – a feat which is easier said than done of course. The trading pattern we’re going to dissect here is based on technical analysis, which is indeed well-suited for the trading of asset-classes that exhibit such high short-term volatility. Fundamentals tend to influence longer-term, more massive bullish or bearish trends, while the technical factors work quite well over shorter time-frames. Because we’re dealing with technical analysis, we’re obviously going to need some sort of charting solution which supports crypto currencies. (We recommend TradingView.) There are scores of free charting services available: just pick the one you’re most comfortable with and let’s roll! The chart time-frame is the first setting you need to get right. For this exercise, time frames in the 5-15 minute interval are recommended. This trading pattern works with larger time-frames too, what you need to keep in mind is to adjust your expiry time to your charting time-frame. In a word: if you use a 5-minute frame, set the expiry of your trade to 5 minutes too. Avoiding the intraday trading hours is another safety-measure you can take to increase the accuracy of the resulting trading signals. The trading pattern that we’re going to use is based on the Support component of the Support and Resistance levels approach, and the PUT component of the PUT/CALL pair. This technique is based on identifying a firm support level and then waiting for the said level to be decisively breached. This moment of breaching is the key moment of the trading pattern: it is where the PUT trade needs to be placed. With time frames as small as 5 minutes, timing is extremely important here. We shall identify our critical support level trough the use of candlestick patterns (make sure you know and understand what candlesticks and their wicks mean and how they work). The pattern we’re looking for in this instance is a bearish candle, which closes at the value where the bullish one – which follows it – opens. Once such a pattern is spotted and the price bounces, you need to remember that a single bounce a support level does not make. To have it confirmed, you need to look for a second bounce, following not long after the first one. With your support level now firmly set and confirmed, the next thing you’re looking for is a strong downward move, which eventually takes the price just below the previously set support level. Once breached, the price will head back up, but at this point, it merely gathers momentum for another breach of the support level. This second breach is likely to take the price well below the said support level for good. Thus, the PUT trade (which essentially bets on the price ending up lower by expiry-time) has to be placed as soon as the second breach occurs. Though it was already said, it bears repeating that timing is of the essence here. The truly cautious can apply a sort of additional filter, to limit the number of false trading signals generated by the trading pattern. It has to be noted though that due to its relative intricacy, this trading pattern isn’t likely to result in many false signals. Still, if you prefer to err on the side of caution, wait for the first bearish candlestick which punches through the support level in the critical moment, to close. If the next candlestick starts out in the bearish direction, do hit that “PUT” button. While the theory behind this trading pattern is relatively simple and straightforward, bear in mind that in practice, with the price-action bounces and support level taking shape in front of your eyes, it’s much more difficult to spot that critical moment when the PUT trade has to be launched. 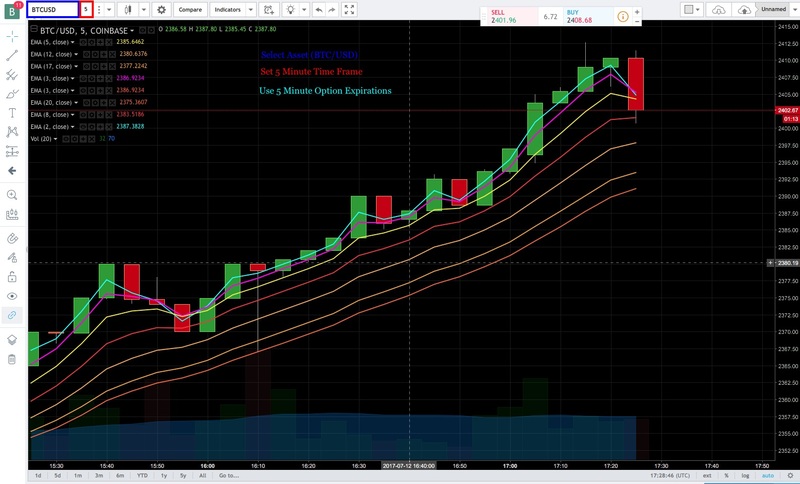 I always recommend that you put technical analysis-based trading pattern into practice on a demo account first, to get the hang- and the feel of it, before staking real money on it. At the end of the day though, some of the brokers who support such Bitcoin-based trading patterns, have some extremely low minimums on their trades (in the 10 cent-$1 range) so it actually makes sense to apply these trading patterns under real money conditions from the get-go. Tried this trading pattern? Make sure to let us know your results by commenting below or send us an email. The above should be seen as educational material and not as investment advice. We are not licensed to provide investment advice. Always consult with a professional before investing. Never risk money you cannot afford to lose. Always try any trading pattern on a demo account before risking real money. Back to Crypto Currency Day Trading.